The hike to St. Mary's Glacier is a short one and includes a beautiful little lake which is fed by the glacier. Before I tell you about the hike though, let me tell you how to find the trailhead. Directions to the trailhead: from Denver, take I-70 west and follow it past the town of Idaho Springs. Then take exit 238 which is marked “Fall River Road”. From there, take a right, (north), on Fall River Road. You’ll see the sign for St. Mary's Glacier and the town of Alice. Follow Fall River Road past the town of Alice until you see the sign on your left that says: Glacier Hike. This is your trailhead and it’s approximately a twenty minute drive here from I-70. There are some hairpin curves on this road but there are also lots of aspen trees along the way so it makes for a beautiful drive in the fall. Anyway, the parking area is just beyond the trailhead, on your left. The parking area has been expanded and now has 23 spaces. It can actually handle 30-40 vehicles when people who arrive in groups, double park. In addition, the owner of the parking area, (Paul Johnson), has opened a new and bigger parking area which will hold well over 100 vehicles. This new parking lot is located just before the trailhead, just before mile marker # 9, on the left side of the road. Both of these parking lots have 2 porta-potties, trash/recycle cans, dog waste bags, and will be open year-round. Also, there is no camping allowed here, either at the glacier, or anywhere nearby. The parking fee is $5.00 per vehicle, per calendar day, and the accepted methods of payment are cash or check only. If you are paying cash, please have the exact amount since there is no place to get change. Thanks :-). 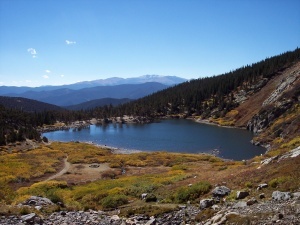 In case you need a place to stay before you go to St. Mary's Glacier, Idaho Springs is the closest town to this hike, and a little further away are the casino towns of Central City and Black Hawk, if you'd like to stay there and try your hand at the slots. Either way, you won't be too far from the trailhead. Dog friendly: yes, but must be leashed. O.K., are you ready? 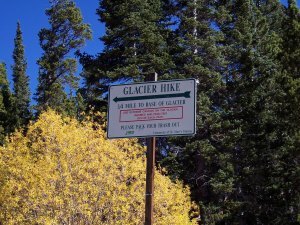 Here's one note of caution before you go: when you arrive at the trailhead, you'll notice that the sign that says "Glacier Hike" also has a warning posted on it. It asks you to use extreme caution on the glacier because injuries and fatalities occur each year. Please take heed of the warning and be careful. So, off to St. Mary's Glacier we go. As you see in this picture, the trail is very rocky. 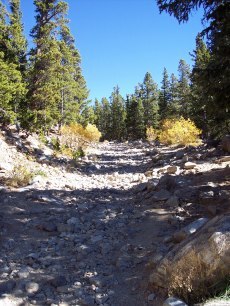 So it’s a good idea to wear your hiking boots even though the hike is fairly short. Also, the trail to the glacier, (and lake), isn’t marked. So, my best advice is this: shortly after you start up the trail, you’ll come to a fork. At this point, you want to take the left fork which goes up the mountain. Shortly after this, you’ll come to another fork. Here, you want to again take the left fork. After this, just follow what looks like the main trail and it will take you to the sparkling lake that is fed by St. Mary's Glacier. As I said earlier, the trail tends to be rocky. It pretty much stays that way until just before you reach the lake. At the lake, you’ll be able to see the glacier. Take a few minutes, (or more), to enjoy the lake, and then follow it around to the right. You’ll cross a small bridge over a creek and from there, you’ll see the trail that goes up toward the glacier. Follow the trail as it climbs toward St. Mary's Glacier and as you do, turn around every once in a while to look at the view down toward the lake. It was especially beautiful on the clear fall day that we were here. One of the best views of the lake is from the base of the glacier. (See picture at bottom of page.) Not only do you have a grand view of the lake, but you can also see some of the surrounding mountains. 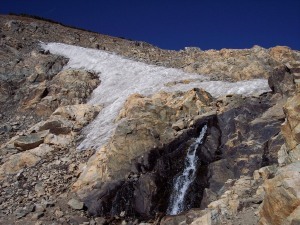 Here's a picture of St. Mary's Glacier as we were hiking up towards it. 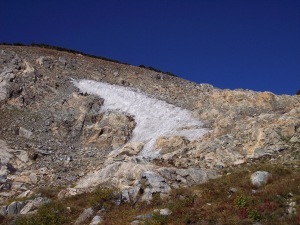 And here's a closeup of the glacier showing the water running out of it. Let me tell you, that water was cold! Here's the view from the base of the glacier that I was telling you about. If you look towards the left of this picture, you can see the trail that leads up from the lake to the glacier. Enjoy! 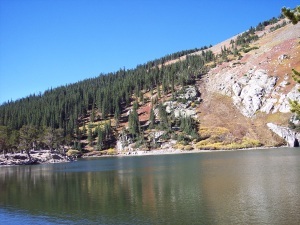 Return from St. Mary's Glacier to Colorado lakes page.